Why are taxpayers still funding ultra-liberal NPR? ConservativeHQ.com has launched a petition to get 1,000,000 signatures calling on Congress to defund NPR. CHQ chairman Richard Viguerie appeared on CNN’s Parker Spitzer show last night to explain, among other things, why their show won’t help CNN’s plummeting ratings. It is, after all, just more liberal perspective in a liberal media world, but our country is center-right. The Virginia tea party convention last weekend was the largest tea party gathering to date. It’s a sign that the constitutional small-government movement is getting more traction, and that the big action — even on federal issues and races — is likely to be at the state level. Over 2,300 Tea Party patriots from all over Virginia and the rest of the country turned out for the first ever Virginia Tea Party Convention in Richmond this past Friday and Saturday. It was the largest convention of its kind nationally in the short history of the movement. In a move that exemplifies the nature of this Congress, our "representatives" voted to break and get home to campaign instead of working on the budget or dealing with any number of important and pressing matters. In a vote reeking of all which is wrong with Congress, Speaker Nancy Pelosi once again put her political interests above the American people’s and voted in favor of getting back to their respective states for campaigning. In a September, 2009 article for American Thinker, Mark J. Fitzgibbons pointed out that Connecticut Attorney General Richard Blumenthal was one of only six Attorneys General to receive a grade of A+ from ACORN. Blumenthal is now considered to be the front runner to secure the Democratic nomination to succeed retiring Democratic Senator Christopher Dodd in November 2010. In Connecticut, at least, it appears the acorns don't fall far from the tree. Fitzibbons' article can be read here. 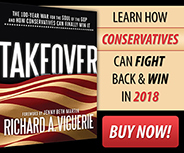 American Conservative – Pat Buchanan agrees with Richard Viguerie that there will be a battle for the heart and soul of the Republican Party after November’s elections, and the fight will essentially boil down to those conservatives who are willing to reduce America’s military empire versus those in the neoconservative wing who want to expand it. Richard A. Viguerie praised the Tea Party movement for providing new energy to conservative grassroots throughout the nation at the January 29 meeting of the Leadership Tea Party. Listen to Richard Viguerie interview today on Mark Davis' radio program on WBAP Radio in Dallas here. "The problem the GOP faces is not so much with Republicans in Name Only (RINO) as it is with the current leadership," says Richard Viguerie concerning the proposal being considered by the Republican National Committee that would deny funding to candidates who did not meet political litmus tests on various issues. “President Obama’s expected announcement that he would support a freeze on non-security spending is another Obama obfuscation," says Richard Viguerie following President Obama's State of the Union Address. Today’s Supreme Court ruling in the Citizens United case means that the anti-incumbent furor that has been growing is partly released from the shackles created by ‘incumbent protection’ election and campaign finance laws.